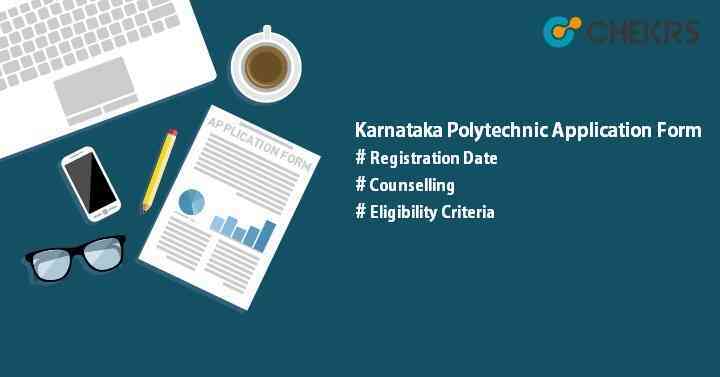 Karnataka Polytechnic 2019 Application Form: The Directorate of Technical Education, Karnataka will release the application form for interested and eligible candidates through online mode. Karnataka Polytechnic entrance exam is conducted once a year for admission in various diploma programmes in engineering & non-engineering field. No exam will be held for entry in government and private engineering colleges of Karnataka state. On the basis of marks obtained in the SSLC or equivalent examination, candidates will get admission into various polytechnic colleges of Karnataka state. To get admission in various diploma courses, students have to register for the Karnataka Polytechnic Registration Form and then merit list will be prepared. On the basis of merit list, counselling will be organized. Before applying for the Karnataka Diploma Admission Form 2019, it will be mandatory to meet all the eligibility criteria prescribed by DTE, Karnataka. Applicants must be a citizen of India and permanent residents of Karnataka state. Candidates must have passed 10th/ equivalent examination from recognized board of Karnataka or Central Board with minimum 35% marks. Candidate should have subjects like Science and Mathematics in class 10th. No upper and lower age limit will be for Karnataka Polytechnic Exam. Students have to show the eligibility certificate issued by the Secretary, Board of Technical Educations, Bangalore if applying the qualifying exam other than Karnataka board. DTE, Karnataka will upload the application form on its official portal for the academic session 2019-2020. The form will be released in the month of May. All candidates are advised to fill and post the form before the last date of submission. Otherwise, they will not be considered for the admission into polytechnic colleges of Karnataka state. Go through the following steps to fill the Karnataka Application Form 2019. Keep all the documents together at the time of filling the application form. Click on the link for Diploma Admission 2019-2020. Download the application form by clicking on the given link “Diploma Application form- SSLC based”. All details must be same as mentioned in SSLC or equivalent examination certificate. Paste the recent photograph in the box given on the form. Put the signature on the form. Choose the college as per your choice. After filling the form, send it to the given address with self-attested required documents and challan receipt. Pay the application fee through challan in any branch of SBI Bank. Applicants have to pay the Karnataka Polytechnic Admission Fee through offline mode. No other mode will be provided to pay the fee. Candidates can deposit the fee in any branch of SBI through challan and then receive the receipt from the bank. Fee will be non-refundable/ non-transferable.